At Book Harvest's Books on Break event at Y.E. Smith Elementary School in May 2015, children select books to take home and keep, to help build home libraries and combat summer learning loss. Q: How can I best help my child be prepared for the next school year? continues Durham Herald Sun. A: Reading in the summer is absolutely vital for students of any grade level or reading ability. Studies show that learning loss during the summer months can be reduced or eliminated — the more our students read, the less they’ll fall behind at the start of the next school year. 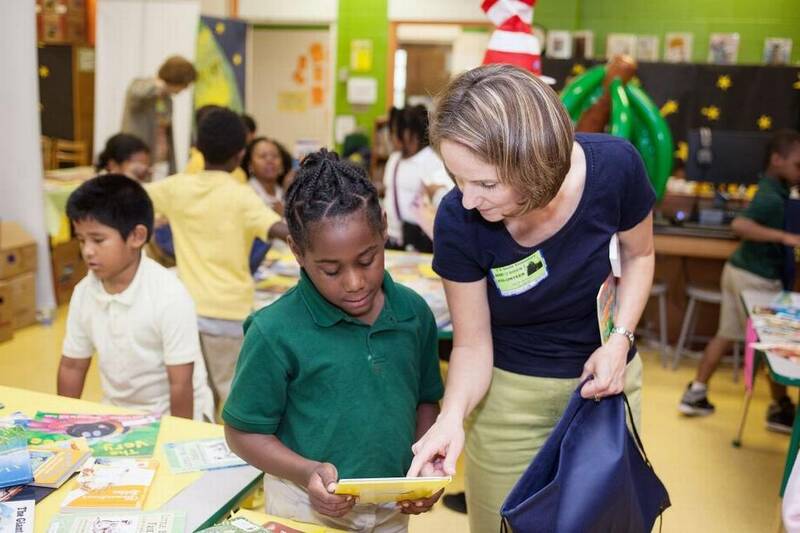 Fortunately, Durham Public Schools has many partners supplying Durham County children with reading material and motivation. Our friends at the Durham County Library kicked off their Summer Reading Program last Saturday at Northgate Mall, but it’s not too late to get involved. The program runs through Aug. 12 with the theme, “Build a Better World.” You and your child may register online at www.durhamcountylibrary.org/summerreading or in person at your local library branch. You and your child can track the amount of time spent reading, earning a point for every minute. The Durham County Library is offering prizes for every reading milestone, from lanyards to sports bags to ear buds to aluminum water bottles, and more.